K has a project for life science to create a scrapbook of sorts with pictures and scientific names of different life forms. 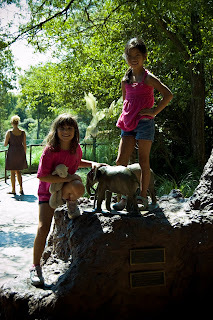 When it was assigned last week, she asked if we could go to the zoo to get pictures rather than pulling everything off the internet. After a check of the calendar (and the weather forecast), we picked Tuesday as the perfect day. 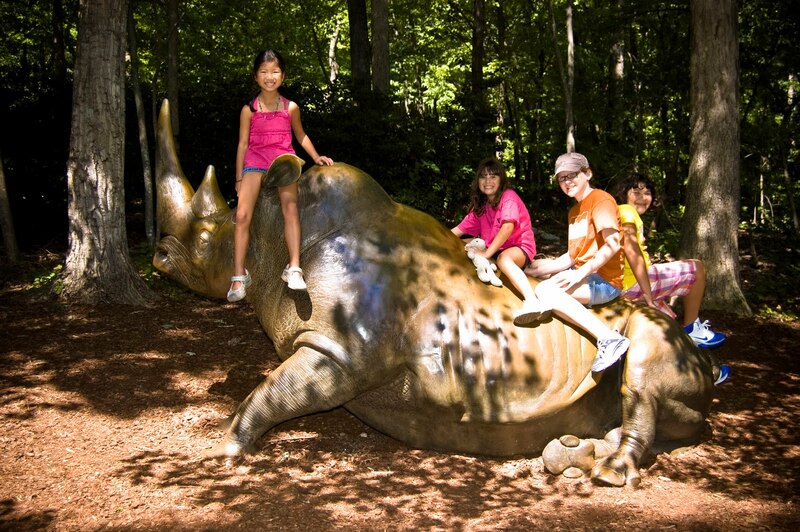 We even invited friends of the girls and had a sleepover Monday night before the big field trip! It was so exciting! 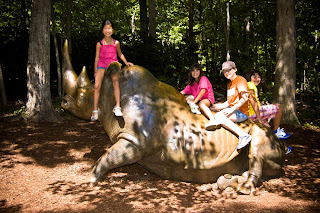 The zoo trip was one of our best ever. 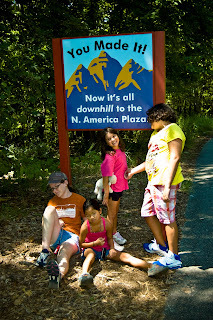 First off, the weather was nice for August - hot, but not oppressive, especially as the zoo is located north of us, on a "mountain", and is heavily wooded. Second, because for the very first time I took only my camera and a small wallet - no stroller, no wagon, no heavy backpack. Just me. It was so liberating! Third, the animals were weirdly, oddly, awesomely active. In spite of the warm August day which would normally mean everything was snoozing in a dark corner, everything was up and moving and coming close, to the point of making eye contact. Even the nocturnal animals. All that strange behavior could be explained by the fact that we had an earthquake yesterday. 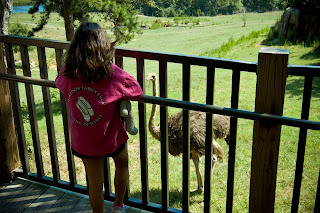 The NC Zoo is about 230mi from the epicenter and I didn't even feel it, but it might have agitated the animals. I've certainly never seen that much activity from zoo animals. First there was the ostrich that was hanging out just below us, looking up and watching us. Then the elephant that wandered over. The bison came as close as their electric fence would allow. 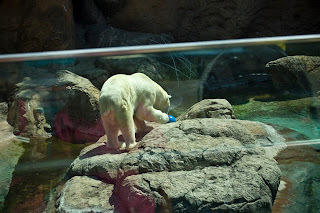 And the polar bear was not only awake, but moving around and playing with a bowling ball. There were many other examples - the bears that paced the back of their enclosure, the cute nocturnal cacomistles that were racing around their exhibit, and the owl that followed us back and forth, pinning us with his intense stare. 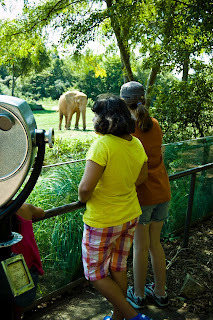 It was definitely weird behavior, but it made for an exciting zoo trip. 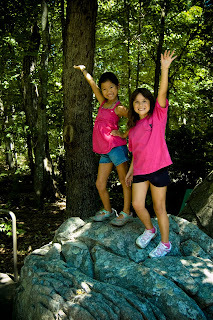 The girls had a great time hanging out together and they learned lots of new things. 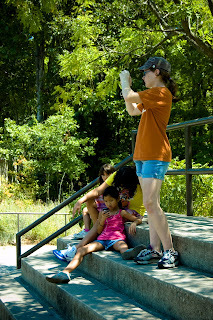 The zoo had a great beekeeper who showed us the queen bee and answered the girls many questions. We talked about geysers and forest fires and Yellowstone National Park. Did you know the scientific name of the bison is Bison bison? I didn't either, but I won't forget. K and her camera were busy and the others were very patient as they waited for her. 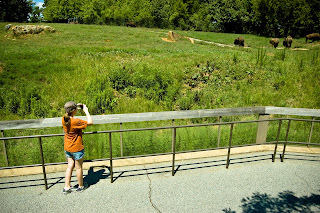 There are many things I love about the NC Zoo - the trees, the large natural environment exhibits, the beautiful and well-kept grounds. Probably all of that contributes to the thing I like least about the zoo - it's HUGE! I think it's a 5 mile walk if you take all the trails (which we didn't) and it's on a "mountain" so it's all up and down. It's so bad that at the summit, there's a sign congratulating you. We were tired, but it was worth it. L and her friend played and raced and posed and exclaimed over the "tiny elephants". K chatted with her friend (because they're far too mature for such childish games) and got pictures of the animals and plants as well as the plaques that gave the scientific names. Now to get the pictures printed and scrapbooked and one more project is checked off. I know she wishes that every school assignment involved so much friends and fun!